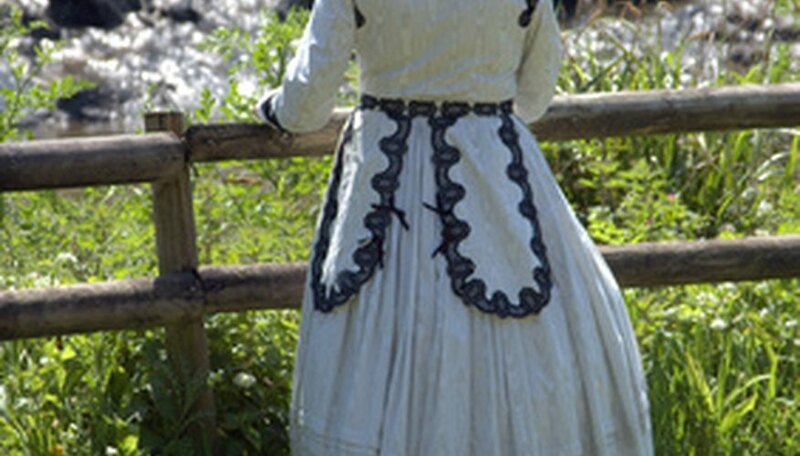 Clothing around the world in the 1800s varied in style from country to country. In the United States, 19th century women’s fashions were largely derived from fashion plates imported from European countries, such as France and Great Britain. Until midcentury, when dressmakers and milliners made tailored clothes widely available in cities and towns across the U.S., most women had to hand-sew their own garments and construct their own hats from dry goods purchased at general stores. Also called underpinnings or foundation garments, women’s fashions in the 19th century required numerous layers below their clothing. Next to the skin, women wore light cotton, short-sleeved or sleeveless slips called chemises. Over this women wore corsets lined with metal or whalebone strips that, when the laces were tightened, would give the wearer an hourglass figure. Throughout the majority of the century, women also wore white cotton shorts that fell to their knees or ankles, which were called pantalettes or bloomers. Over the bloomers, women wore various garments throughout the century to hold out their floor-length skirts, including petticoats, bustles, polonaises, tournures and crinolines, which were also called hoop skirts. Whether day or night, women’s dresses in the 1800s were always floor-length. While the length never changed, styles changed drastically throughout the 19th century. In the early 1800s, women’s dresses and skirts were typically draped loosely, hanging straight down from the bosom in the neoclassical Grecian style. Toward the middle of the century, skirts widened into a bell shape, held out by petticoats and crinolines. As the century aged toward its end, skirts flattened in the front, with the back puffed out with bustles, polonaises or tournures. Above the skirt, women wore bodices, blouses and shirtwaists with waist and sleeve styles shifting with the times. Early dresses had high Empire waists, while later bodices became more structured with lower, fitted waists. Sleeves also changed in style and length throughout the century, with both fitted and puffed sleeves, or a combination of both known as the leg-of-mutton sleeve worn by Gibson Girls. Bonnets were the headwear of choice for women in the first half of the 19th century. Bonnets were made from a range of fabrics, from silk to velvet, that was stretched over straw, buckram or millinery wire bonnet forms. Bonnets were embellished with decorative items, like feathers and faux flowers, and fastened with wide ribbons that tied under the chin. Sandals and slippers fastened with ribbon straps were the fashionable footwear for women in the early decades of the 19th century, however, many women found the shoes impractical for the rough U.S. terrain. High top leather shoes and boots with varying heel heights that fastened with small buttons soon replaced the impractical footwear. However, some women continued to wear slippers indoors.